The daughter of Antonio Napoleone Visintainer and Anna Pianezzer, she was born to a poor but pious family. In September 1875 her family, along with 100 other folks, about a fifth of her home town, emigrated from Italy to the state of Saint Catherine in Brazil to seek a better life. There the Italian emigres founded the village of Vigolo (modern Nova Trento). She received First Communion about age twelve. In her early teens, Amabile began teaching children catechism, visited the sick, and cleaned the church. On 12 July 1890 Amabile and her friend Virginia Rosa Nicolodi were caring for a woman suffering from cancer. From them and their work began the Congregation of the Little Sisters of the Immaculate Conception, approved by José de Camargo Barros, bishop of Curitiba. They and Teresa Anna Maule took their religious vows in December 1890; Amabile took the name Sister Pauline of the Agonizing Heart of Jesus. Their congregation grew quickly, and in 1903 Mother Pauline was elected Superior General for life. Even with her new responsibilities, she left Nova Trento in late 1903 for Saõ Paulo to work with orphans, the children of slaves, and aged slaves who had been left to die because they could no longer work. In 1909 she was relieved of her duties as Superior General by Duarte Leopoldo e Silva, Archbishop of Saõ Paulo following a series of disputes within the congregation. She was sent to work with the sick and aged at the Hospice of Saint Vincent de Paul at Bragança Paulista. She spent her spare time in prayer in support of the Congregation. In 1918 she was recalled to the Congregation's motherhouse of Ipiranga. She lived there for over 20 years, caring for sick sisters, praying, and living away from the world. In 1938 her health began a long, slow decline as she fought a losing battle with diabetes. The Congregation continues its work today in Argentina, Chile, Nicaragua, Chad, Zambia, Mozambique and Italy. They combine interior spirituality with service to those in need, drawing strength from devotion to the Eucharist, the Immaculate Virgin, and Saint Joseph. She is the first Brazilian citizen to be canonized. Sixth of eleven children born to Antun Petkovic-Kovac and Maria Marinovic. Raised in a wealthy family known for their charity to the poor. Educated in public elementary school and then the School of Domestic Science run by the Servants of Charity. Made her First Communion in 1905 at age 13. She joined the Daughters of Mary in 1906, felt a serious call to religious life, and on 21 November she made a private vow of chastity. President of the 300 member Daughters of Mercy from 1909 to 1919. Member of the Good Shepherd Association, a group of twenty young women who visited the sick and helped children prepare for their First Communion. Her father died in 1911 when Mary was 19, and she had to help raise her younger siblings. Founded the Society of Catholic Mothers in 1915. Led a group of 200 Franciscan tertiaries in 1917, and began working in a Servants of Charity soup kitchen. Her work led her to become well-known and well-loved in her home town of Blato, Croatia, and in 1918 she promised its citizens that she would stay to live and help them. 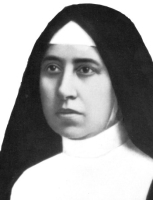 On 25 March 1919 she and her friend Marija Telenta joined the Sisters of Charity. However, in May the superior died, the Italian sisters were forced to leave the country, and Mary, Marija and two other Croatian sisters were left to handle the work in the area. Mary was put in charge, and requested that the remaining Sisters follow the Rule of the Third Order Franciscans. Few as they were, in 1919 the Sisters still opened a recovery center, a child-care facility, and an orphanage. On 25 August 1920, Mary wrote the first Constitutions of a new order. On 4 October 1920 it was founded as the Congregation of the Daughters of Mercy, Mary taking the name Marija of the Crucified Jesus. She served as the Superior General of the Congregation for over 30 years, helped found 46 communities of the Daughters serving in hospitals, nursing homes, schools, seminaries, and parishes. Her health failed in her later years, and she was partially paralysed the last three years of her life. "Good Teacher, what must I do to inherit eternal life?" (Mark 10:17). This is the question that Sister Marija of Jesus Crucified asked her Lord from the time of her youth in Blato on the island of Korcula, when she took active part in the life of her parish and devoted herself generously to others in the Association of the Good Shepherd, in the Association of Catholic Mothers, and in the people's Kitchen. The response echoed clearly in her heart: "Come and follow me!" Overwhelmed by the love of God, she chose to consecrate herself to him for ever and to fulfil her aspiration to total devotion to the spiritual and material well-being of those most in need. 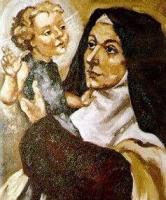 Later she founded the Congregation of the Daughters of Mercy of the Third Order Regular of Saint Francis, with the specific task of "spreading knowledge of God's love through the spiritual and corporal works of mercy." Difficulties were not lacking, but Sister Marija persevered with indomitable courage, offering up her sufferings as so many acts of worship and supporting her Sisters by her words and her example. In the mid-16th century the Spanish painter Alonso de Narvaez created a portrait of the Virgin of the Rosary. He painted in pigments from the soil, herbs and flowers of the region of modern Colombia, and his canvas was a rough 44 inch x 49 inch cloth woven by local Indians. The image of Mary is about a meter high, and stands about a half moon. She has a small, sweet smile, both her face and the Child's are light colored, and she looks like she's about to take a step. She wears a white toque, a rose-coloured robe, and a sky blue cape. A rosary hangs from the little finger of her left hand, and she holds a sceptre in her right. She holds the Christ Child cradled in her left arm, and looks toward him. Christ has a little bird tied to his thumb, and a small rosary hangs from his left hand. To either side of Mary stand Saint Anthony of Padua and Saint Andrew the Apostle, the personal patrons of the colonist, Don Antonio de Santana, and monk, Andrés Jadraque, who commissioned the work. In 1562 the portrait was placed in a rustic chapel. It was exposed to the air, the roof leaked, and soon the damage caused by the humidity and sun completely obscured the image. In 1577 the damaged painting was moved to Chiquinquirá, Colombia, and stored in an unused room. In 1585 Maria Ramos, a pious woman from Seville, cleaned up the little chapel, and hung the faded canvas in it. Though the image was in terrible shape, she loved to sit and contemplate it. On Friday 26 December 1586 the faded, damaged image was suddenly restored. It's colors were bright, the canvas cleaner, the image clear and seemingly brand new. The healing of the image continued as small holes and tears in the canvas self-sealed. It still has traces of its former damage, and the figures seem brighter and clearer from a distance than up close. For 300 years the painting hung unprotected, and thousands of objects were touched against the frail cotton cloth by pilgrims. This rough treatment should have destroyed it, but it healed and survives. In 1829, Pope Pius VII declared Our Lady of Chiquinquirá patroness of Colombia, and granted a special liturgy. In 1897 a thick glass plate was placed over it to shield the painting from the weather and the excess zeal of the faithful. The image was canonically crowned in 1919, and in 1927 her sanctuary declared a Basilica. Youngest of six children born to Waclaw and Leokadia Spurinska. Raised in a pious family. Studied in public schools and a military academy. Worked for a year at Szczuczyn Mowogrodzki in the Institute of Social Insurance. Worked at the Central Post Office in Warsaw, Poland. Member and administrator of Catholic Action. Worked against alcohol abuse and helped recovering alcoholics in his region. Joined the Secular Franciscan Order at the Capuchin church in Warsaw. Friend of Blessed Anicet Koplinski. Joined the Capuchins on 27 August 1933, taking the name Fidelis. Developed a great devotion to the Blessed Virgin Mary. Studied philosphy at Zakroczym, Poland. Founded a Club for Intellectual Collaboration for the seminarians. Continued his work with alcoholics, working a group of Franciscans. Studied theology in Lublin, Poland, begining in 1937; his studies were interrupted by the German invasion of Poland in September 1939. Arrested for his faith on 25 January 1940 and held in the "Fortress of Lublin". On 18 June 1940 he was moved to the prison camp at Sachsenhausen. To this point Fidelis had kept his optimism, hope and simplicity, but this camp broke him; the abuse of himself and the other prisoners sent him into depression. On 14 December 1940 he, with other priests and religious, was transferred to the Dachau concentration camp; tattooed with his prisoner number, and subjected to more abuse. Abused, starved and over-worked, he developed a serious heart condition and finally died from the abuse. His last words to fellow prisoners as he was being taken away were, "Praised be Jesus Christ; we'll see each other in heaven." Born wealthy, the daughter of Francesco Giuliana and Benedetta Mancini. In her youth, Ursula developed a deep spirituality and desired nothing more than to dedicate her life to God. She received visions as a child, and her first words were reported to be "Do justice, God sees you," said to a crooked merchant. Ursula's father presented suitors in hopes that she would marry her; the girl became ill at the idea of not devoting her life to God, and she finally received her father's blessing on her call to religious life. She joined the Poor Clares in Città di Castello, Umbria, Italy, on 17 July 1677 at age 17, receiving the veil on 28 October and taking the name Veronica. In 1693 she received visions that indicated that the Passion would be re-enacted in her own soul; in 1694 she received the first sign of the stigmata, in her case the visible wounds of the crown of thorns; on Good Friday in 1697 she received the wounds on her hands, feet and side. She submitted to medical treatment and many examinations, never trying to prove the stigmata was real, just suffering through the wounds, the exams and the scorn of her peers. Veronica served as novice mistress for over thirty years; she refused to let them read any related to visions or mysticism, insisting that they become practical brides of Christ. Chosen abbess of her house in 1716, and served for more than a decade. Her 10-volume Diary of the Passion catalogues her religious experiences. Born to the English nobility, the son of Sir John Fortescue, and a cousin of Anne Boleyn. Made a Knight of Bath in 1503, frequently serving in the royal court of King Henry VIII. Fought for England in France in 1513 and 1522. Married twice, and father of seven. Made a Knight of Saint John in 1532. He collected several lists of proverbs and folk sayings, often writing them in the margins of his Book of Hours. On 29 August 1534, for reasons never explained, he was arrested by the king's order, and imprisoned for several months. Arrested again on 3 February 1539, and sent to the Tower of London. Without trial, he was condemned to death in April for treason, though no specific act was alleged, only general "sedition and refusing allegiance", a consquence of his loyalty to Rome. Martyr. Daughter of a cooper and a housekeeper. Irma was an active, affectionate, sensitive, intelligent but sickly child, and her education stopped at the elementary level. She felt drawn to religious life, but her family opposed it, She worked as a tutor to make her own way, and in 1894 she entered a pre-novitiate of the Franciscan Missionaries of Mary at Vanves near Paris, France, then her novitiate at Les Châtelets in July, taking the name Marie Hermine de Jésus. Her poor health caused her to spend a longer than usual noviate, proving that she was capable of the rigors of missionary life. She served in her house by taking care of the accounts in Les Chatelets and Vanves, caring for the sick in Marseilles, France and then as superior of the missionaries in Taiyuanfu, China. In 1898 she and six sisters were sent to the Shanxi diocese in China to serve the poor in hospitals, and care for the unwanted or other destitutes in orphanages. There they all died in the Boxer Rebellion. One of the Martyrs of Shanxi and the Martyrs of China. Son of a Venetian gondolier. Parish priest in the archdiocese of Venice, Italy, ordained on 24 September 1842. Worked with children and teens who had been abandoned or were homeless. On 30 April 1850 he founded a school for poor and abandoned girls, and with two like-minded catechists, formed what would become the Figlie di San Giuseppe (Daughters of Saint Joseph). In 1857 he founded a home for poor girls, in 1859 a school complex for the poor, and later a free college. In 1869 he was assigned to re-organize and re-vitalize the Manin Institute, a trade and craft school for men. In 1881 he took over two more impoverished schools and managed to re-vitalize them and re-staff them with religious devoted to teaching. His health began to fail, and he was confined more and more to his home parish where he spent him non-management time conducting retreats for clergy and laity. His health continuing to fail, Father Luigi spent his final years out of the public eye, living much a like a prayerful hermit, keeping track of his beloved institutions, but unable to visit them The Daughters continue their good work today in Italy, Brazil, Kenya and the Philippines. Raised in a pagan family, he worked in cotton for a while, and then as a blacksmith. Convert some time after 1802. Layman catechist in the apostolic vicariate of Guizhou, China. Married; widower. He lived an quietly, giving what he could to the poor, fasting, and having services and teaching in his house. Arrested during an official persecution in 1814; he was tortured and finally exiled to Ili, Mongolia. There he worked with other Christians, even building churches. Joakim aided soldiers assigned to fight Muslim rebels in the area, received commendation for his work by the commanding general, and was allowed to return from exile in 1832. In 1836 he was arrested during another wave of persecutions, ordered to renounce his faith, and put to torture when he refused. Martyr. Desert hermit in Egypt. Helped lead Saint Patermutius to the faith. At age 45 he was arrested in the persecutions of Julian the Apostate for refusing to sacrifice to idols. Through flattery and the offer of riches, Julian convinced Copra to renounce Christianity. Copra was then sent to convince Patermutius to apostasize. Instead, Patermutius convinced Copra to return to Christianity. For this, Julian had Copra's tongue torn out of his head, and had him thrown into a furnace with Patermutius. The two were unharmed by the flames, and were seen standing in the fire and praying; this show of faith and strength brought Saint Alexander of Egypt to convert. Copra was pulled from the furnance and executed. Martyr. A notorious robber and thief, he converted to Christianity, brought to the faith by Saint Copra. Desert hermit in Egypt. At age 75, he was arrested in the persecutions of Julian the Apostate for refusing to sacrifice to idols. Julian sent Copra, who had renounced Christianity, to convince Patermutius to do the same. Instead, Patermutius brought Copra back to the faith. Thrown into a flaming furnace for his defiance, he was unharmed by the fire and was seen standing and praying; this show of faith and strength brought Saint Alexander of Egypt to convert. Patermutius was then pulled from the furnace and executed. Martyr. From an early age, Jane felt drawn to religious life. Her family opposed the vocation, and she obeyed them, living a pious, austere life in her parents' home. On their deaths she founded the Our Lady of the People Carmelite priory at Reggio, Italy, and served as its first prioress. She refused all endowments or gifts to the convent unless they were given as alms with no strings or conditions attached. Her prayers reportedly resulted in miracles. Soldier in the army of emperor Julian the Apostate. When he witnessed the faith and strength of Saint Patermutius and Saint Copra when they were thrown into a flaming furnace, he was convinced of the power of Christianity, and announced he was converting. He was immediately throw into the furnace with them. Martyr. Seventh century English nobility. Convert to Christianity. Nun, entering a convent at York with Saint Bega and Saint Wuldreda under the direction of Saint Wilfrid. Assigned by Wilfrid to lead a large community of nuns at Bishop's Farm (later called Everildsham in her honour, and today called Everingham). Noted spiritual director of her sisters. A group of Christians enslaved by Diocletian to build the gigantic baths in imperial Rome, Italy. The end of their labours coincided with the beginning of the great persecutions of Diocletian, and they were all executed. Ancient records indicated there were 10,204 of them; Zeno of Rome is the only one whose name has come down to us, and we know nothing else about any of their individual lives. Prison guard. 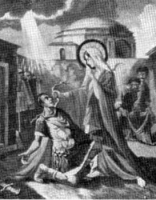 During the persecutions of Decius, Audax was one of the guards of Saint Anatolia, who helped convert him. Martyr. Bishop of Martola, Italy. Imprisoned in the persecutions of Diocletian, but was not martyred. Considered a confessor of the faith. Monk at the Studion monastery in Constantinople. Spiritual student of Saint Metrophanes. Bishop of Minden, Westphalia (in modern Germany), chosen with the support of Blessed Charlemagne. Missionary to the Saxons. Elderly bishop of Gortyna, Crete. Tortured and martyred in the persecutions of Decius. Bishop of Autun, France. Ordained Saint Germanus of Paris. 32 nuns from several orders who spent up to 18 months in prison and were finally executed for refusing to renounce Christianity during the persecutions of the French Revolution.